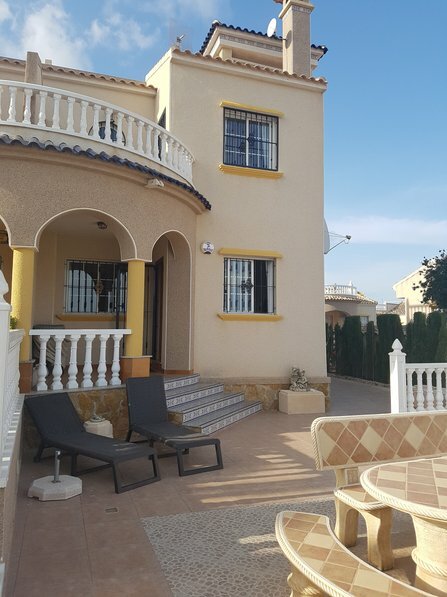 Beajutiful property in a quiet urbanisation just outside the town of Guardamar. Convenient to all amenities: 5 mins to beach and town. The property is built to a very high specification and has beautiful views from the Solarium on the roof top. The accommodation is suitable for six people with linen and all mod cons supplied. Security grills and alarm are fitted for your peace of mind. An ouside Barbeque and lighting for your convenience. There are three double beds, (one twin) and one with baclony facing south towards the blue lake. A spacious solarium is ideal for those who love the sun and yet want privacy in the shade. The house is in El Raso five mins. from Guardamar town and blue flag beach. It is maintained to a high standard. There are local shops, restaurants, bank, pub and a church. The blue flag beach, Dunes of Guardamar with an open air cafe/restaurant and icecream bar is five mins. Fantastic Natural Park in Guardamar attracts young and old alike. The old town of Torrevieja with its beautiful Marina is ju10 mins away. Terra Mitica Theme park is 45 mins in Benidorm. Wed. & Sun. are market days when all enjoy the leisurly bargin hunt! All in all, a perfect location for an relaxing and fun filled holiday. Lake & surrounding hills. , La Finca, and Campoamor Golf Clubs just 10 mins.from the house. Wed. & Sun. Markets 5 mins.